Lisle, IL is an affluent suburb in DuPage County boasting more than 1,000 businesses. Several corporations of national recognition located there are spread along I-88. They also have local businesses and shopping districts supported by an active 300-member Chamber of Commerce. Their downtown area features unique walkways that appear welcoming to all residents as they pass by local antique shops and restaurants. With a population of about 23,000 residents, Lisle continues to attract Illinois residents looking for a smaller town with a pristine selection of housing options. The village has been ranked as one of the best places to live for wealthy singles by Money Magazine. Founded in 1832 by a Quaker settler, Lisle’s beginnings led to a farming community known as DuPage, which later led to the founding of the county that is known today. Lisle is known as “The Arboretum Village” because of the prairie-like grassland riddled throughout the area. Lisle’s 25-mile proximity from Chicago makes it an ideal village for those working in the city. The transportation options, like the rail, allow residents to travel in and out of the village with ease. Lisle has relied on Carmody Construction for window, siding, roofing and remodeling jobs since our founding over 50 years ago. Our dedication to construction is evident in our decades of service to Chicago land area. We will not rest until the job is done to our standards and your satisfaction. Patrick Carmody, our owner, took over his father’s business in 1976. The rest of the Carmody boys joined in 1991 when the company started building unique homes in the suburbs of Chicago. 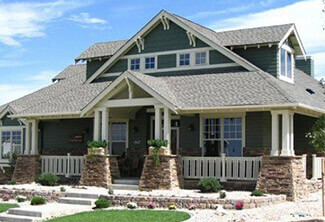 In Lisle, we have built numerous homes to the complete satisfaction of our customers. Unlike other construction companies, we make the permit process simple to prevent any delays. If you’re looking for a new roof, windows or siding, Carmody Construction has you covered. We’re also perfect for bigger projects like room additions, bathroom remodels, and kitchen remodels. Our veteran team will ensure your satisfaction and turn your dreams into a reality. Contact Carmody Construction, your local contractor, for a free consultation on your Lisle home. Live in Lisle? Need Windows, Siding, or Roofing Services? Schedule an appointment today! Pat and his family are the best! He takes care of not only our business needs but our family’s also!